Thank you to all the farms who entered the contests and provided the heirloom and hybrid varieties for the customers to taste! 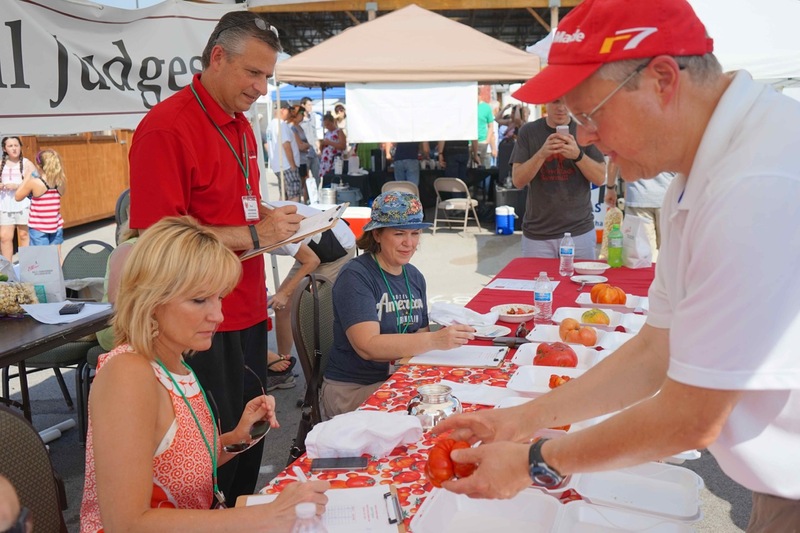 Everyone enjoyed the competition and the tomato sampling at the judges table. 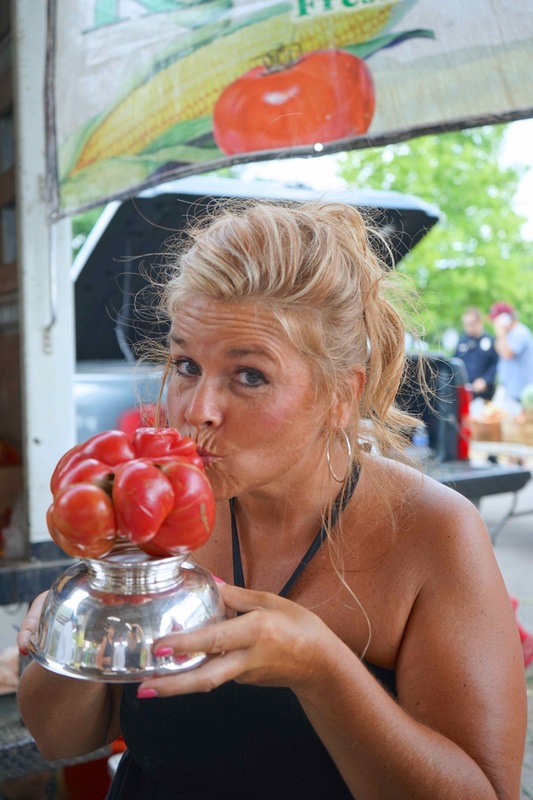 Theresa Thoni with the award winning Ugliest Tomato. 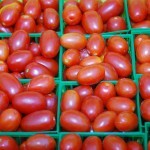 A big thank you to our sponsor of tomatofest – Amerigo’se Paul Schramkowski and to Chef Steven Robilio for appearing on Talk of the Town this week to showcase his wonderful Panzanela Salad! The customers raved over his fabulous creation Saturday! 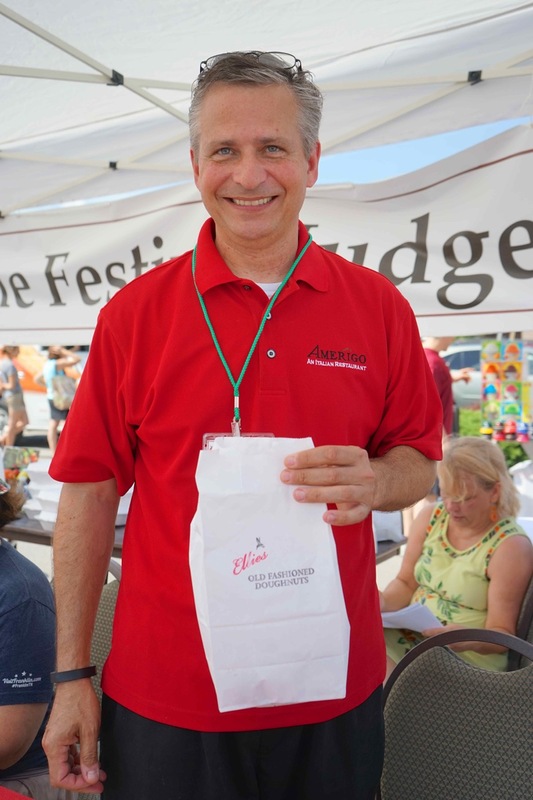 Paul Schramkowski helps as judge and event sponsor. Yes, even Paul could not resist sneaking away and getting some of Danny’s famous Ellie’s Doughnuts. Tennessee Senator for the 23rd district, which is composed of Williamson County. Tracy Kornet is a five-time Emmy Award winning news anchor, host and writer for WSMV-TV Channel 4. 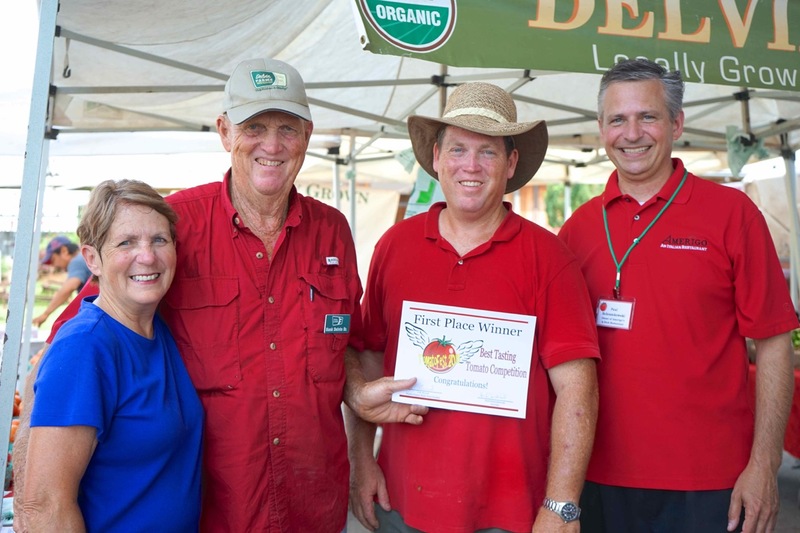 What a great event and we want to thank all of our customers who help support us each week by shopping with our farmers at the market. 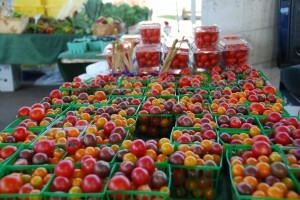 Looking for a great tomato festival next year! 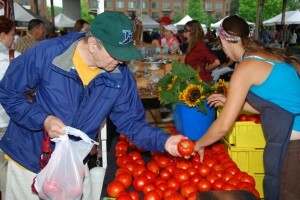 This entry was posted in Market Festivals, Market Saturday News and tagged farmers, heirloom, judges, record crowd, Tomato, Tomato Festival on July 21, 2015 . 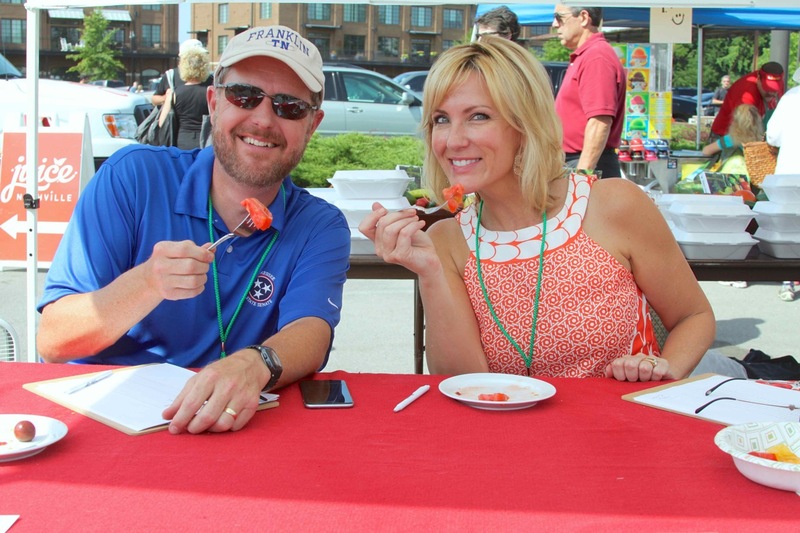 The Franklin Farmers Market was featured on WTVF Channel 5 Talk of the Town today with Lelan Statom and Meryll Rose honoring this years Franklin Farmers Market TomatoFest. 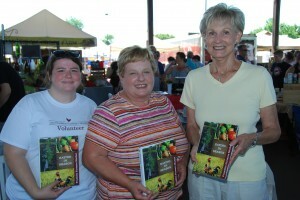 Gayle Franks represented the Franklin Farmers Market with a tomato pasta recipe from the farmers market new “Eating in Season” recipe cookbook! Gayle chose to prepare and cook the recipe “Fusilli with Raw Tomato” with host Lelan Statom of WTVF News Channel 5 of Nashville, Tennessee. 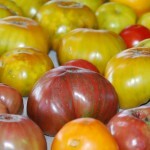 The tomatoes used in today’s recipe were heirloom tomatoes, bradley tomatoes along with other tomato varieties from our farmers market. Gayle did a wonderful job representing the Franklin Farmers Market on News Channel 5’s Talk of the Town with Lelan Statom. 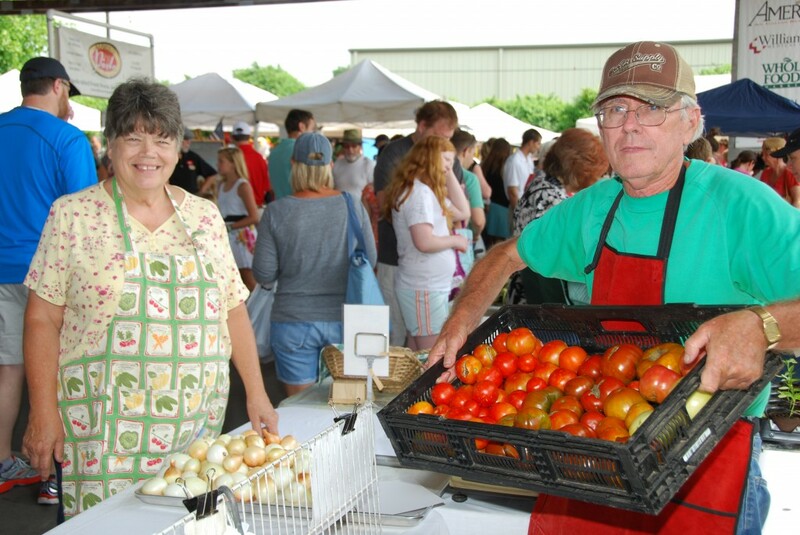 Lelan asked about this years TomatoFest and Gail shared that visitors will be able to taste many of the different varieties of farm fresh tomatoes Tennessee Farmers grow and bring to our farmers market each Saturday morning. 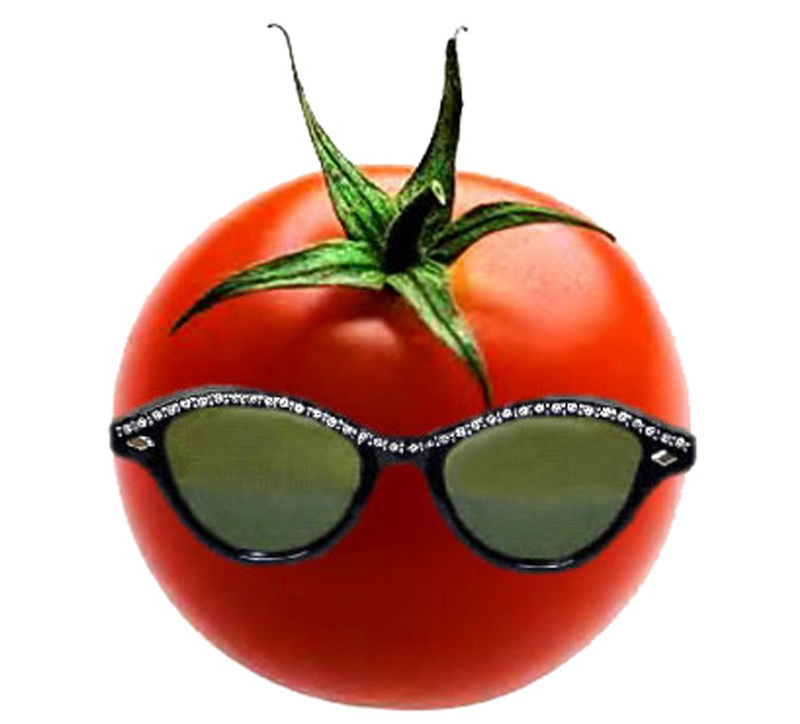 We expect a big day celebrating the Tomato used in so many fresh healthy food recipes at this Saturday’s Tomato Festival in Franklin, TN. 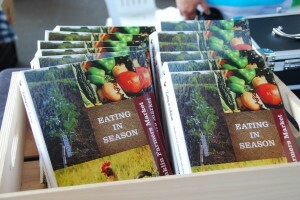 The Eating in Season recipe cookbook is designed to be used with farm fresh ingredients for family fresh cooking. 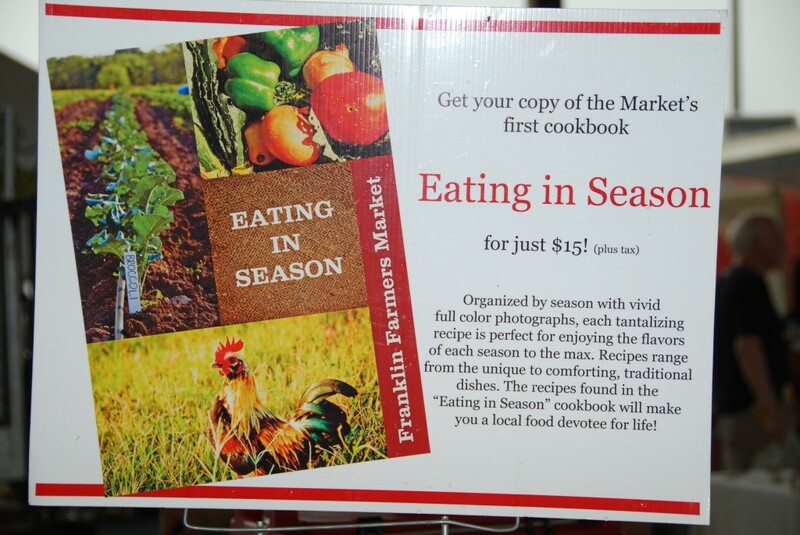 The new Franklin Farmers Market recipe book Eating in Season will be available for purchase every Saturday during market hours 8am till 1pm. 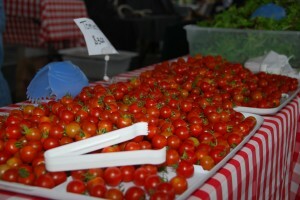 Hope to see you Saturdays at our Tennessee Farmers Market! 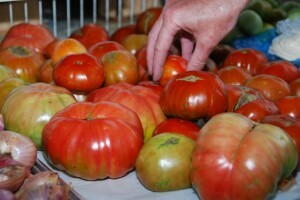 This entry was posted in Talk of the Town and tagged bradley tomatoes, Eating in Season, family fresh cooking, farm fresh ingredients, Farmers Market, Franklin, Franklin Farmers Market, fresh healthy food recipes, fresh tomatoes, Fusilli with Raw Tomato, Gail Franks, heirloom tomatoes, Lelan Statom, Meryll Rose, Nashville, News Channel 5, recipe cookbook, Talk of the Town, Tennessee, Tennessee Farmers, Tennessee Farmers Market, TN, Tomato, Tomato Festival, tomato pasta recipe, tomato varieties, tomatoes, TomatoFest, WTVF Channel 5 on July 24, 2013 . Hatcher Dairy Farm on NBC Today Show with Al Roker! Did you get to see the Hatcher Family on the NBC Today Show yesterday morning? If you missed Al Roker of the Today Show broadcasting from the Hatcher Family Dairy Farm in College Grove, Tennessee, here are a few links to coverage of the show broadcast from the Hatcher Family Dairy. What great weather for a special NBC Today Show segment with Al Roker direct from the Hatcher Family Farm! Charlie Hatcher told me last week how excited they were that Sharon had entered a contest called “Wake Up With Al” 2 weeks ago. After entering Hatcher Family Dairy online into the “Wake Up With Al” contest Sharon Hatcher received a phone call within a few hours asking them to be available for an interview. From there, Charlie says it all happened so fast. Congrats to the Hatcher Family on representing Middle Tennessee and Tennessee Farmers so well! 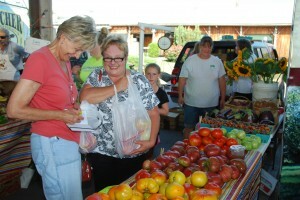 We are all so proud to have Hatcher Family Dairy as part of the Franklin Farmers Market! Real Farmers! 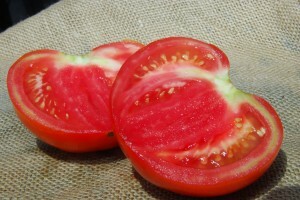 Real Food! Real Good! If you find any more footage from the Today Show segment “Wake Up With Al”, please email us and we will add it here. This entry was posted in NBC Today Show and tagged Al Roker, Amerigo, Amerigo Italian Restaurant, beets, blackberries, blueberries, cantaloupes, Charlie Hatcher, cherry tomatoes, College Grove Tennessee, corn, Delvin Farms, Farm Fresh Produce, farmers, Farmers Market, Franklin Farmers Market, Fresh Green Beans, fresh veggies, fruits, Growing Kids Educational Garden, Hatcher Dairy Farm, Hatcher Family Dairy, heirloom tomatoes, Middle Tennessee, NBC, Organic Farms, Organic Produce, peaches, Sharon Hatcher, Silver Queen corn, squash, Strawberry Festival, Tennessee Farmers, Tennessee Farmers Market, Tennessee farms, Today Show, Tomato Festival, tomatoes, Wake Up With Al, watermelons, Whole Foods Market on May 9, 2013 .